Saturn's largest moon, Titan, appears deceptively small paired here with Dione, Saturn's third-largest moon, in this shot snapped by NASA's Cassini spacecraft on Nov. 6, 2011. Titan is much farther from the spacecraft than Dione is in this view. The view was captured at a distance of approximately 684,000 miles (1.1 million kilometers) from Titan but only about 85,000 miles (136,000 km) from Dione. NASA's Cassini spacecraft has captured stunning shots of three of Saturn's moons, showcasing the diversity and beauty of the ringed planet's natural satellites. 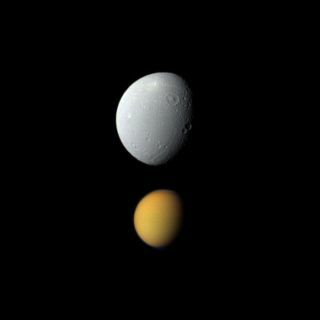 The Cassini probe recently beamed home photos of Titan, Dione and Enceladus, three of Saturn's six largest moons. The giant planet has 62 known satellites, but most of them are small, rocky moonlets too small to be rounded by their own gravity. One of the newly released photos shows Titan passing in front of Saturn and its rings. Titan is the ringed planet's largest satellite; at 3,200 miles (5,150 kilometers) wide, it's nearly 1.5 times bigger than Earth's moon. Saturn's largest moon, Titan, passes in front of the planet and its rings in this true color snapshot from NASA's Cassini spacecraft. This view looks toward the northern, sunlit side of the rings from just above the ring plane. It was taken on May 21, 2011, when Cassini was about 1.4 million miles (2.3 million kilometers) from Titan. Titan has a thick, nitrogen-rich atmosphere that shrouds the frigid body in a soupy brown haze. Complex organic molecules — the carbon-containing building blocks of life as we know it — swirl about in this atmosphere. Another of Cassini's new photos shows Dione, an icy, pockmarked globe 698 miles (1,123 km) across. The moon's leading hemisphere is heavily cratered, while its trailing one sports an intricate web of ice cliffs. NASA's Cassini spacecraft obtained this unprocessed image on Dec. 12, 2011. The camera was pointing toward Saturn's moon Dione from approximately 69,989 miles (112,636 kilometers) away. Cassini also snapped a stunning new photo of Enceladus. At 319 miles (513 km) across, Enceladus is Saturn's sixth-largest moon — but it may be the gas giant's most intriguing satellite. Icy geysers erupt from Enceladus' south polar region, fueled by a powerful interior heat source of mysterious origin. And scientists think an ocean of salty, liquid water lurks beneath the moon's icy crust, making Enceladus another key target in the search for alien life in our solar system. This photo shows the leading hemisphere of Saturn's moon Enceladus. The image was captured on Nov. 6, 2011 by NASA's Cassini spacecraft, when the probe was about 67,700 miles (109,000 kilometers) from the icy moon. Cassini launched in 1997 and arrived at Saturn in 2004. It has been studying the ringed planet and its many moons ever since, and will continue to do for years to come. Last year, NASA extended the probe's mission to at least 2017.